Got your hands on the brand new Samsung Galaxy S7 or Galaxy S7 edge? It’s always exciting to upgrade to a new smartphone, and even more so if you are changing the platform/manufacturer. If you are new to Android – or Samsung’s phones for that matter – you might need a little help in performing regular tasks on your smartphone. In an effort to help our readers who are new to Android get the most of their new devices without getting frustrated in the process, we keep sharing helpful tips and guides. Today’s addition in our series of Android Tips and Tricks covers one of the most basic operations – taking a basic and a scrolling screenshot. If you need to quickly take a screenshot of your friend’s super embarrassing comment before they delete it, don’t worry we are here to help you out. Open the screen that you want to capture. This could be any screen in your smartphone, inside an app or even the home screen. Press and hold Power and Home buttons together. You will hear a sound and your screen will also show a quick animation of taking the screenshot. You can access the freshly taken screenshot from the notification pulldown bar, from where you can instantly share or edit. To view all of the screenshots, go to Pictures > Screenshots. Taking a screenshot with hardware keys sound so last-decade to you? You can also use gestures to take a screenshot on your Samsung phone. Once used to this, you will never go back to the awkward use of Home+Power key combo. Activate gestures: go to Settings > Motions. Inside the Motion menu, look for Hand Motions. Check the Palm Swipe to capture. 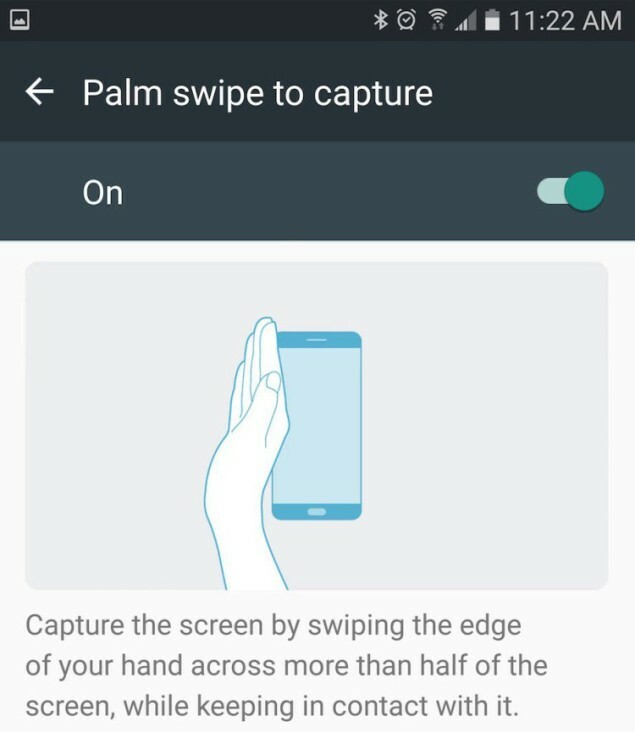 Once you have activated the gesture, you can now grab a screenshot on Galaxy S7 using gestures. Now swipe the edge of your hand from right to left or left to right, horizontally. This edge-to-edge swipe gesture may take you a few tries to master, but it makes taking screenshots so much easier and quicker. Again, go to the notification pull over for quick sharing and edit, or access all of the screenshots from your phone’s gallery. From Advanced settings, you can enable Smart capture which shows additional information after you take a screenshot. After taking a screenshot, you can instantly edit or share it. But along with sharing and editing, this toggle also allows you to take a scrolling screenshot. Enable Smart capture from Advanced settings. Follow any of the above methods to take a screenshot. Once the first screenshot is taken, tap on Capture more that will make the screen scroll down and capture more content. When you are done, you can press back or tap anywhere on the screen (other than the screenshot options) to stop the process and save the entire scrolling screenshot. If you keep the Smart Capture enabled all the time though, it could be a little annoying. Especially if you have to take multiple (non-scrolling) screenshots quickly, as you face an additional pop-up after every single screenshot. You can simply enable this option when you need to take a scrolling screenshot and keep it disabled otherwise. 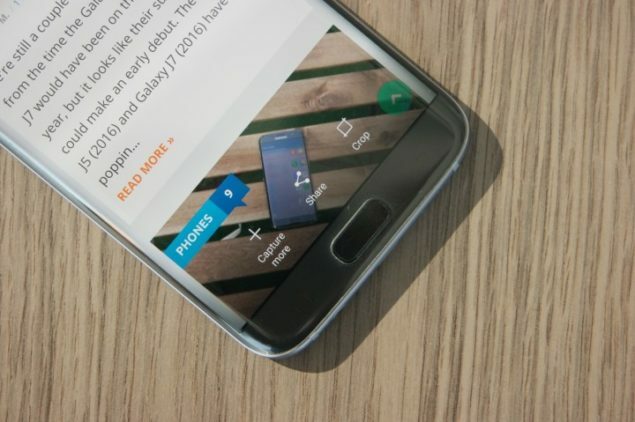 Don’t forget to let us know if you want us to focus on some other feature use in our Samsung Galaxy S7 and S7 edge guides. Worried about battery drain? Check our detailed post on fixing Galaxy S7 and S7 edge battery drain issue.